Staging a League race can put a strain on the resources of small clubs, such as ours. However, everyone rallied round magnificently and we were able to both organise the race and field competitive teams. Something always manages to get in the way of a big field; last year it was the clocks going forward and the Loughborough Half, this year it was Mother’s Day. Nonetheless, we still managed to attract nearly 400 devotees of the Kibworth WI cake stall to the South East corner of the County. The promise of some good hills must have attracted Mike and he was in excellent form, leading in the team in 14th, with Nick following in 24th. Mark (74th) just managed to stay in front of the fast improving Harry (75th) and Sam J (81st) got away from Will (85th) in the closing stages. Steve (112th) underlined his new status in the team before Jerry (116th) completed the eight. To be fair to Jerry, he did run to the race from Oadby as part of his prep for an ultra! Dale (123rd) produced his usual solid finish and then we had Chris (164th), another one who likes his hills. Tom (174th) and Lee (190th) were next up then Dave (193rd) and Simon (194th); the latter having also run to the race as part of his build up for the Paris Marathon. Our final pair were Keith (240th) and Ham (264th). The Hogettes have made a great start to the season and they weren’t found wanting on the hills. Bec continued her rich vein of form; recording another top 10 finish (8th). Jackie (15th) and Charlotte (21st) continued the good work and Rae (25th) had a strong run to give us an excellent team score. Ruth (41st) finished well up to ensure our vets score was good too, and she was followed by Trudy (75th) and Alison (125th). Perhaps with a month’s gap since the last race, it was no surprise that Ashby attracted a record field. The mercury was barely breaking zero, and there was a cold north-easterly but it was nice and dry under foot; perfect for fast times. Even with the technical section close to the end the course can be covered quickly, and so it proved. Dale and Ruth decided to add to the task by completing the 16 mile Belvoir Challenge the day before. John, of course, had to go one better; he’d done the full 26 miles. In addition to these seasoned campaigners, we were pleased to welcome Morgan, Lorena and Jess for their LRRL debuts. Nick (24th) seemed to take an ‘OK, but no cigar’ attitude to his run but in fact he only missed his PB by 3 seconds. Mark R (41st) nailed yet another PB and Will (87th) made a big step forward from Barrow (19s/mile quicker). Mark C (107th) managed to hold off the challenge of the fast improving Harry (108th) and John D (119th) smashed yet another PB. Sam J (134th) also registered back to back PBs before we had Morgan (154th) completing the scoring eight with an impressive run. Next up was Steve W (164th) who had one of those ‘where did that come from?’ runs; a PB and a sub-35 was always on the cards, but a sub-34 was something else altogether. Despite his exertions, Dale (176th) wasn’t far behind (still sub-35) and Lee (178th) was on his tail. Tom (184th) was the last of the dozen men who broke 35 minutes. Roger (227th) was back making his first start after a brief injury layoff and looked in good shape finishing in front of Martin (248th). Keith (293rd) finished Barrow on one leg, so it was a pleasant surprise to see him back finishing right on Ham’s tail (292nd). John (302nd) may have had a 26 mile warm up the day before but he still had too much for Ian (305th) and Dave (306th)(but at least we still beat the gorilla!). Our final pair, Steve (331st) and Dave S (333rd), have given years of service to both the club and the League so it was good to see them back in action. Captain Jackie led from the front at Barrow but here she was forced to chase Bec (15th) who stormed to an awesome sub-35 PB. Not that Jackie (16th) will be complaining about the PB she added to her burgeoning collection. Charlotte (29th) may not be getting much opportunity to train but she is certainly going well; taking her chance to grab a PB. Ruth, our fourth counter took a little longer than usual to knock off the 5 miles but 21 miles is a good weekend’s work in anyone’s book. Trudy gave it her best shot, but that dam gorilla had too much of a finishing kick! Our debutants, Lorena (110th) and Jess (135th) both went well, and that left just Alison (145th) to complete the finishers. 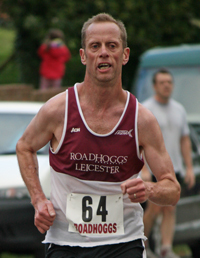 The first race of the new season is always a chance to catch up with old friends (and rivals) and to welcome a crop of new Hoggs to the Leicestershire Road Running League. After all of the snow it was a relief to swap husky racing for road running. Of course the sudden thaw and overnight rain meant the Soar had burst its banks and blocked some approach roads; something Dale found to his cost (he should have remembered that 'Lodstradamus' predicted this sort of watery mayhem in his almanac). Having avoided snow-mageddon (the race would have been cancelled if the thaw had arrived 24 hours later that it did), the race only took place because of council incompetence. How so, I hear you ask? Well, an hour or so before the race a truck full of plant pulled into the car park of the Three Tuns. Fortunately, the race director happened to be nearby so he asked the driver what was happening. The driver duly announced that he was setting up traffic lights on the junction at the end of Cotes road as a precursor to digging the road up. The race was only saved because it subsequently transpired that someone at the council had ordered the wrong gear and they were unable to start work. It was great to see Zorro (Mike Munday) ride out of the west and we also welcomed Will, Harry, Robin, Steve R and Rae for their first league outings; hopefully the first of many. Jackie had a great second half to the 2012 season, regularly setting new personal bests; it looks like 2013 is going to be no different as she stormed to 28th in a new PB time. Almost matching her was Charlotte (29th), just 5 seconds behind. These two were well backed up with Ruth (58th)(closing out a great vets team score) and Rae (an impressive 62nd) completing the scoring four. Amy (78th) finished in front of Barbara (89th) but Barbara had a PB for consolation, before Clare(128th) came in a bit down on her usual, courtesy of some impressive Marathon miles the day before. Trudy (132nd) was nursing a bad back and Lucy (172nd) and Alison (173rd) crossed the line together. Whenever two Hoggs finish together, Kim always accuses them of chatting instead of racing; on this occasion I have no doubt that he would have been right! As the first race of the season, Barrow always attracts a quality field so Nick (19th) did well to kick off with a top twenty finish. Mike had intended to make the fairly short trip across the fields from Mountsorrel but when he found that that would involve a significant amount of swimming he was forced into a circuitous route and a much more challenging ‘warm up’ than he’d planned. 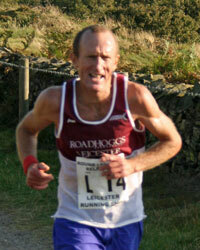 In the circumstances, his 36th place was a great result. Mark R scooped the ‘most improved’ award at the recent presentation evening but shows no sign of resting on his laurels; not only did he hit the top fifty, he also set another PB. For Will, this is all uncharted territory; by the look of his highly impressive 102nd, he’s in no need of a map! Mark C (11th) is feeling his way back after a long injury lay-off but John D (124th) is the form of his life; here he produced a PB run to see off Jerry (126th). Needing one more for the eight we got a pair, with Harry (133rd) impressively pipping John H (134th) by a solitary second (John set a PB and followed this by running back to Leicester – the joys of Marathon training). Sam J (149th) got his season off to a solid start with a PB finishing before Dale (166th), who had managed to put a bit of distance into Colin B (187th) and Tom (209th). Lee (220th) seemed to be suffering but the sight of Dave L (221st) drawing level just gave him the prod necessary to make the line first. These two were followed by a pair of debutants; Robin (244th) and Steve R (245th) coming through in front of Steve W (249th). Baz (273rd) was next up, with John S (328th), Ian (331st) and Richard (352nd) following in a while later. Barry (371st) continues to amaze and our tail-gunner was Keith, who had to walk after his hamstring went ‘ping’ on the way round.